Happy Monday to you! I have to say this weekend went fast and I didn’t even do anything exciting. Sometimes it’s just nice not doing anything. However I did try something new. 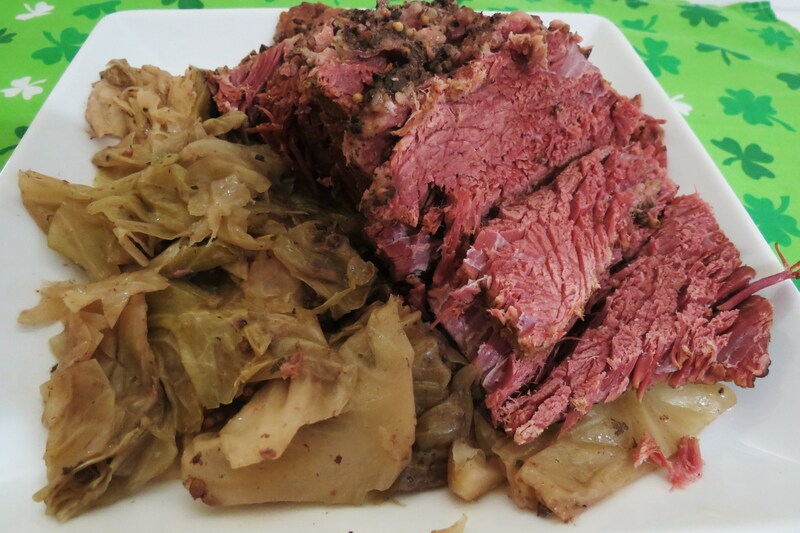 I had corned beef and cabbage for the first time ever. Can you believe it? A first! I was at Trader Joe’s and they had it as a sample, but of course it wasn’t ready yet. I told the lady I never had it and she convinced me to buy it. So I bought a HUGE 3.5 pounder (smallest one they had) and came home and threw it in my crockpot. I am really impressed with this, I can’t believe I waited so long to try it. This was my Husband first time having it too. Crazy! Since it was just my husband and I for dinner, we have a ton and I mean a ton left over. Besides a Rubin sandwich, anyone have any other suggestions on what I can do with it? probably just heat up. I used Trader Joe’s Corned Beef which was marinating in some juices. It smelled so good cooking. It almost smelled like it had a cloves in it. I added an onion, water and cabbage, put it in my crockpot for 5 hours on high. Cooked perfectly. You know what else was nice? My Husband bought me this massive crockpot for Christmas and this was the first time I used it. I think it made him happy to see it get used. Since I started blogging, I really am enjoying all the holiday themed food. It’s fun to make something new, beats the everyday food. I didn’t think there would be much for St. Patrick’s Day, but I’m wrong about that. I can’t wait to see what I’m going to create for Easter. 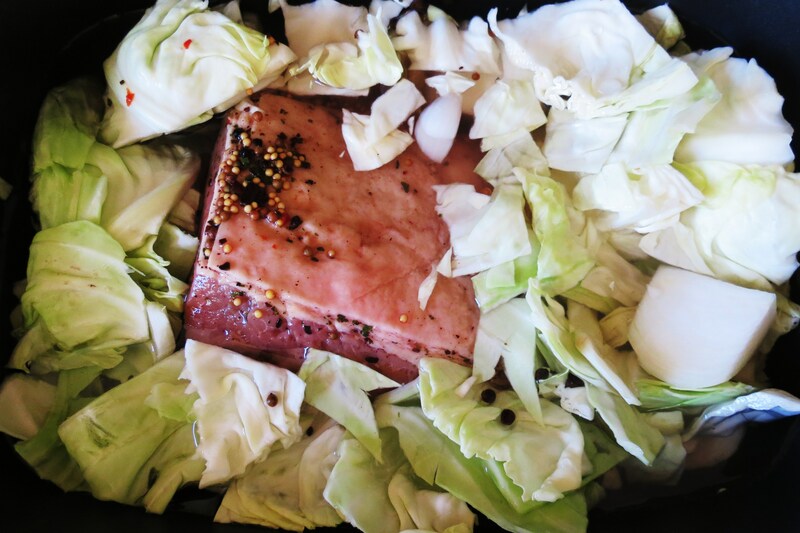 In a Crockpot, add corned beef, onions and cabbage. Add enough water to cover the top. Cook in a slow cooker for on low for 6-8 hours, high for 4-5 hours. I served it with a side of roasted butternut squash and my homemade Rye Bread. This was a delicious meal!! It’s a shame, I’ll probably only make this once a year! Look forward to St. Patrick’s Day 2013!! Speaking of St. Patrick’s Day, do you have plans this year? My Husband works on that Saturday and so does Jenny, so I’ll probably be home baking! Also, as you know I was nominated for Healthiest Eating Food Blog on Fitness Magazine and would love it if you voted for me. So far I only have 36 votes, if you like my blog, please vote for Peanut Butter and Peppers. To vote for me, just go here. Thank you!! The winner for the Peanut Butter Giveaway was Amy from Healthy, Happy, Hungry. Congratulations. I’ll mail your prize out on Tuesday! This beef look amazingly soft and juicy! No wonder why it was a big hit! I would love to try it. In Greece we use more veal than beef. You have a beautiful collection of recipes in your blog! Good morning, Thank you so much! I bet veal would be good in sub of beef! Have a great day!! Mmmmmm. Nice job!!! 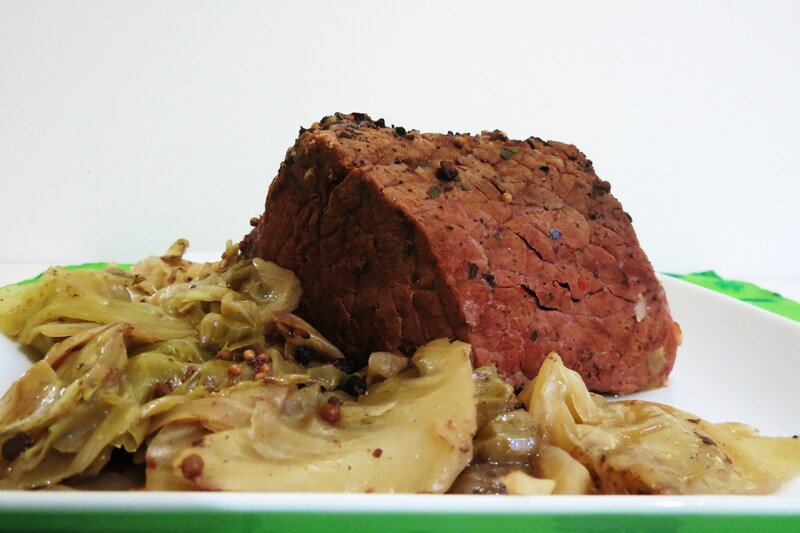 Your corned beef looks amazing. I kinda wanna reach out and eat some thing morning 🙂 YUM! Thank you!! I’m taking Dea’s idea and thinking of an egg bake with the corned beef, add a little swiss cheese and onions and i bet it would be good! 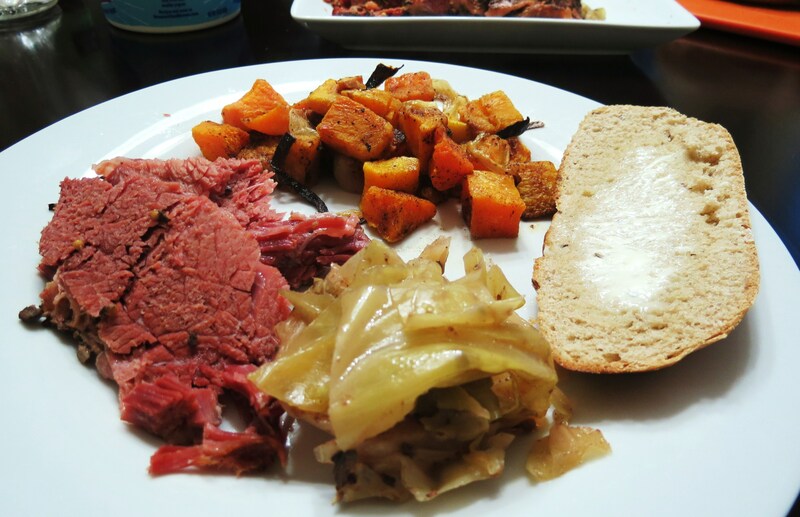 I always look forward to making a corned beef every year, it always make lots of meals and I really love it! I love that you are making this in the crock pot. I may have to follow suit! What a delicious dinner! You have to love the crockpot. I go through phases where I use it a lot and than forget about it for a couple of months, it’s so easy and convenient and my favorite part is when I come home from work and dinner is done!! Check out Dea’s comment, she has a great recipe for left over corned beef!! We have so much left over. My Husband loves meat, but 3 1/2 pounds is way to much for two people. 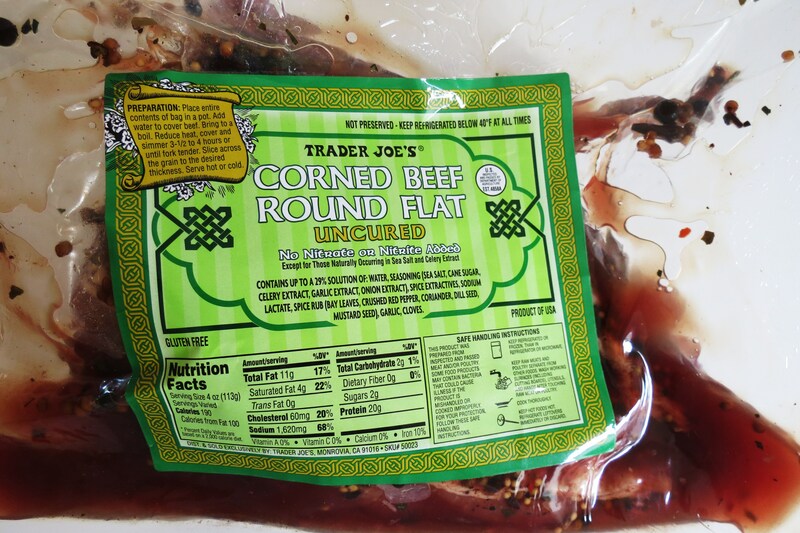 I found your blog when I was also looking for recipes using TJ’s corned beef–I have never made one either but have been feeling totally tempted every time I have been to TJ’s the past 2 weeks. Can you clarify if you just threw all the spices and juices from the package into the crockpot and then added water to cover or did you rinse them off? Thanks! Can’t wait to make this! Hi Hillary! I just dumped the whole pacakge in my crockpot spices and all,than addeded an onion, head of cabbage that I bought at TJ’s and water to cover. That’s it, easy, peasy! Let me know what you think of it! It was fantastic. I made this horseradish sauce too, but with quite a bit less heavy cream (not for health reasons–just because I didn’t have enough!) and it was the perfect combo! Whip cream to soft peaks and then fold in sour cream and horseradish, to taste. Season with salt, pepper and a dash of hot sauce. That sound perfect with the Corned Beef! My Husband would LOVE your horseradish sauce. I’m going to make it!! If you make it let me know. Potatoes would be really good with this dish too, it’s just that hubby wasn’t in the mood for any, otherwise you would of saw them rather than my butternut squash! Love it! I LOVE corned beef, I’m glad you made it. I think I’m going to have to make a stop at Trader Joe’s this week! Oh, stop there, the marinade has great flavor! I love corned beef!! Usually just boil it in the bag though. My Birthday is on St. Pattys and am going to a bar called the Shamrock! Will put this in before I leave! Happy early birthday! The Shamrock is going to be fun on Saturday night! Enjoy your birthday celebration! I just made slow cooker corned beef the other day! I added carrots to mine and used beef broth. Thanks for the buzz! I was going to throw carrots in it, but I forgot to buy them. I am really pleased that I liked corned beef. I really don’t understand why I never had it before? I don’t understand why growing up with a huge population of Irish that no one, including my family ever made Corned Beef, strange! But glad I made it! Look forward to using the leftovers and than making it again next year!! Oh and adding beef broth is a great idea! Now that’s a great sounding dish!!! I think that will be tomorrows dinner. Thank you!! Wow, that really looks like it came out great! 🙂 Love corned beef, I’ll have to try the Trade Joe version! 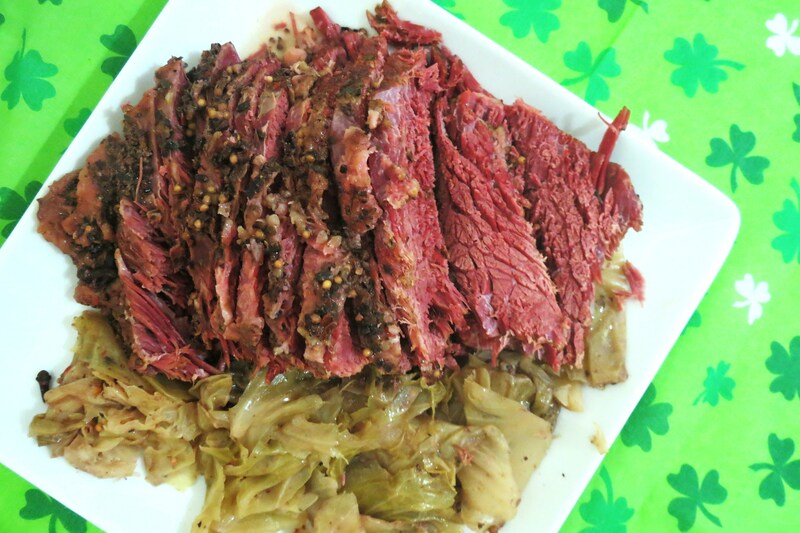 Mmmm I still have some leftover corned beef that I need to use so I am definitely doing this! I stumbled across your website by accident and I’m glad I did. I love it!! Everything looks soooo yummy. I especially love your version of the shamrock shake. I’m trying that one out ASAP, as well as the corned beef. 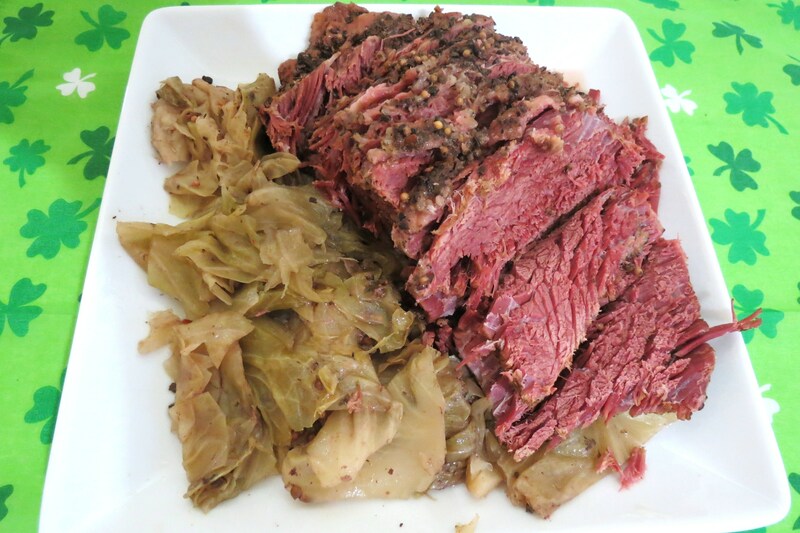 I’ve had corned beef in restaurants and loved it, but have always been scared to attempt it myself. The fact that it’s done in the crock pot is very appealing to me. I am all about one pot meals!! I’m Type 2 diabetic and I really like that you give the nutritional info for your recipes. Thank you for all that you do for us foodies! !